A solo weekend at Le Bristol, Paris re-defined elegance for me. The magic of Paris to me is walking or cycling the streets, never knowing what or who I will find around the next corner – a gorgeous bar, an incredible monument, an amazing atelier, a lovely local to practice my French conversation with. I find the joys of Paris are endless and on my last trip I found a new one. I was fortunate enough to stay at Le Bristol, one of the most famous luxury hotels in the world and one of Paris’ most elegant hotels, and I can honestly say it was one of the most indulgent, uplifting travel experiences of my life. This hotel was the first to be designated a Palace – a class above five star. From the old-school elegance of the luxurious, opulent, antique filled foyer to the spacious suites and indoor pool, attentive, kind staff, and even the gorgeous white cats who are in residence, the hotel is classically, quintessentially French, and simply beautiful. The interiors include huge bouquets of fresh flowers to 17th century antique tapestries, and French Versailles style furnishings. Located in the fashion, design and art district, everything is at your fingertips and a short walk away when you stay, from the Champs Elysees, to the Eiffel Tower, the Arc De Triomphe and even Mr Macron’s office. Even The Louvre isn’t far. Cafe Antonia is a relaxed spot for breakfast which sees businessmen and guests sitting side by side in the traditional French setting to enjoy meals, drinks and snacks all day. A swimming pool in Paris is a rare luxury, and this one is beautiful with ocean style panelling. Restaurant 114 Faubourg, the hotel’s luxury restaurant Epicure was awarded 3 Michelin Stars in 2013, and has a firm reputation as one of the world’s best restaurants. It is a delight for lunch or dinner. A fine dining restaurant with chandaliers, there is an acute attention to detail at every turn, from the food to service, it’s perfect for romance, business or simple to enjoy. The sign of a truly great hotel are staff who remember what you ate or drank the day before , and all of the wait staff at Le Bristol remembered everything I consumed. The clientele were mostly French when I ate there , even in high summer. Guests can also choose to have breakfast here. Executive Chef the légion d’honneur-decoarted Eric Frechon has accrued no less than four Michelin stars since arriving at le Bristol Hotel. The other one belongs to Le 114 Fauborg, slightly less formal with rich, contemporary French cuisine and experimental flavour combinations. Café Antonia – one of two breakfast locations on offer – features a striking portrait of Marie Antoinette, and this drawing room style location is perfect for a morning or afternoon coffee or snack. 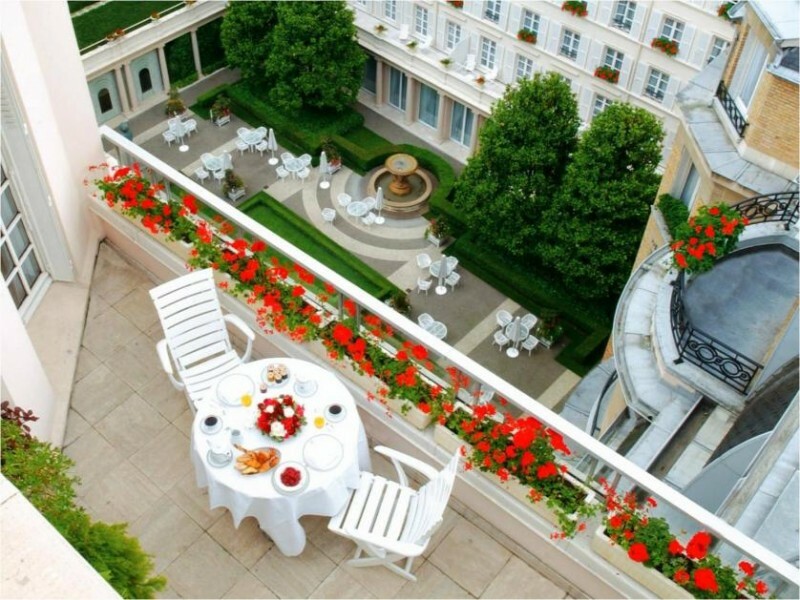 Courtyards are almost sacred ground in Paris, they are one of the many great architectural joys of this brilliantly designed city, and the courtyard of Le Bristol, (Le Jardin Francais) in summer has an energy about it you wont find in any other hotels. Breakfast, lunch or dinner, it is where the beautiful people gather – both foreign and French to relax, chat in various languages & indulge. This year artist Daniel Buren created a spectacular multicoloured gazebo in the garden, where guests could enjoy a meal, or simply a gorgeous glass of champagne whilst soaking in the summer light and warmth that is Paris in July. The food at the hotel is heaven. Everything from a fillet of fish for lunch, ceviche for dinner, French summer berries to a Japanese breakfast tray is fresh, is cooked to perfection. I couldn’t stop eating. The bar of any upmarket hotel can speak volumes about the clientele, as well as the staff and feel, and and the bar at Le Bristol quickly became my favourite place to hang out by night. Intimate, but not too small with a huge cocktail list and gorgeous bar snacks, there was no need to leave. Spas have improved much in recent years, and the spa at Le Bristol is sublime. Doors overlook the elegant courtyard garden which are opened on a summer’s day as you lie with the breeze outside gently caressing the room, being completely transformed with a La Prairie massage or facial. So indulgent and relaxing. There are even personalised massages on offer. Renae Leith-Manos at the front of the hotel. There are 188 rooms and suites, and the feel is traditional grandeur and rooms vary in size and style, but all are large by Paris standards. There are plush carpets, luxe marble bathrooms with heated floors in winter, and the interiors are French anqtiue in style – think florals and cream pallettes. Many have views into the hotel’s striking internal courtyard.There’s even an original 194o’s style elevator. Paris offers so many wonderful experiences, but this hotel is one you will not want to leave. You are spoilt at every turn, and everything is intimate, and luxurious. Life is short, don’t miss Le Bristol. I cannot wait to return. 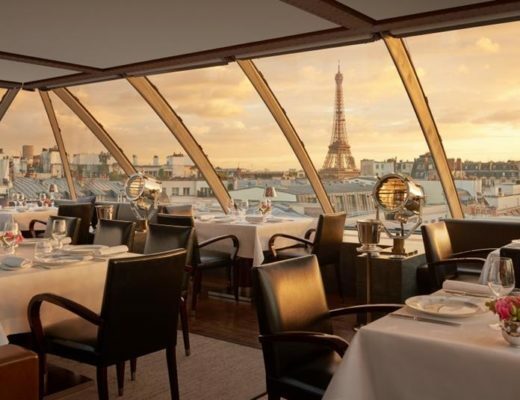 For some Paris Restaurants you will love, click here. Updated in January 2019.